In previous blog we discussed the essential points that should be kept remember while choosing a home for rental. And now we will discuss the necessities if you are willing to purchase home from landlord. While choosing a rental home we emphasize each and every aspects of home, and when we started living in the home. In future if we find the chance to buy that home then most of us will agree to buy the home. 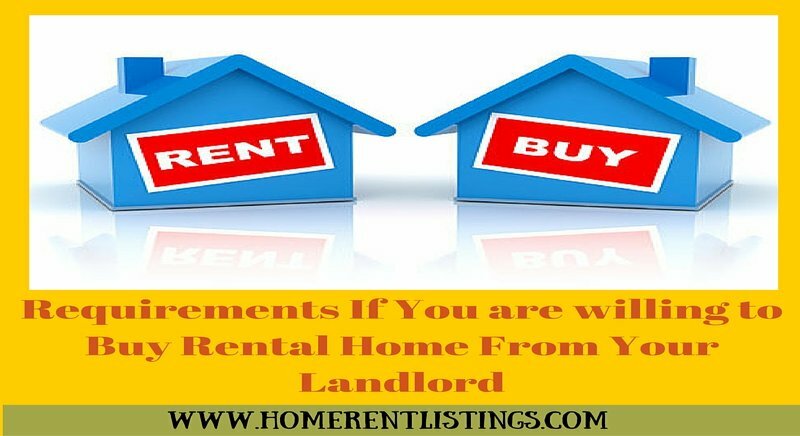 There are some reason why people try to buy their rental home from landlord, then we assume that there can be two major reasons behind this. First is, they are familiar with the landlord and home, they think that there will be no chance of fraud and they also do not have confusion about quality of home as they reside there. And second reason may be the emotional intimacy with the home, locality and people. When people live somewhere for some time, they feel attachment with surrounding. From the security point of view also people prefer to live on familiar place. Although if you have made the choice to buy the rental home, then you should be careful and clear with the following things. Know the remaining taxes and other charges on home, ask your landlord to provide you all pay slips bills and receiving of recent payments on home like electricity bill, home tax, lease tax and all other related expenses. Although in the absence of many taxes it is not possible to transfer the property to another property but prevention is always better then cure so check all payments and recent bills. Cancellation of rent agreement, suffice the legal requirement to cancel the rent agreement after buying the home to ignore future disputes. If you do not get the rent agreement canceled, then the landlord can take advantage of it in future. Check the status of loan if taken, we all know that home is really a big investment and 90% people take loans to buy or get the home built. So ask your landlord that has he taken any kind of loan for home or on home. If there is any loan on home then understand it wisely that how it will be repaid and what will be the impact of loan if it is transferred to you. Buying home is really a tough decision because a wrong decision can take your huge money away so ask what you ask, do what you can do to make your decision right. Even after the completion of deal, you should be active and get your name registered on different bills, just to be headache free.